People always say "You can do anything you set your mind to", but is that really accurate? Could I have pursued a multitude of professions when I was growing up and determining a path for my education? Certainly. Could I have worked harder, maintained a stronger focus on my goals and been at the top of my class? Sure. It is amazing what a person can achieve when they know what they have to do to get to where they want to be. Yet I still don't truly believe the word "anything" belongs in that first quote. Some people can work night and day and become great, but it takes more than that to be a genius of a craft. I was pretty good at basketball growing up, but no matter how hard I practiced, no matter how many shots I took, I was never going to be Michael Jordan. I also had a pretty strong knack for golf. At one point I was even the Captain of my high school team, but no matter how many rounds I played, I was never going to be Tiger Woods. I bring this up because some films take me to a place that resides far beyond words like admiration or fondness or even love. Sometimes I will watch a work and my first reaction is one of jealousy because I think to myself, "Why couldn't I be capable of making something like this?". I was born in April, the year 1984 and by the time I took my first breathe I honestly believe it had already been decided: I was never going to be Andrei Tarkovsky. Only a few men in the history of cinema even play in the same league. Some people are just born with a gift that is hard to comprehend. 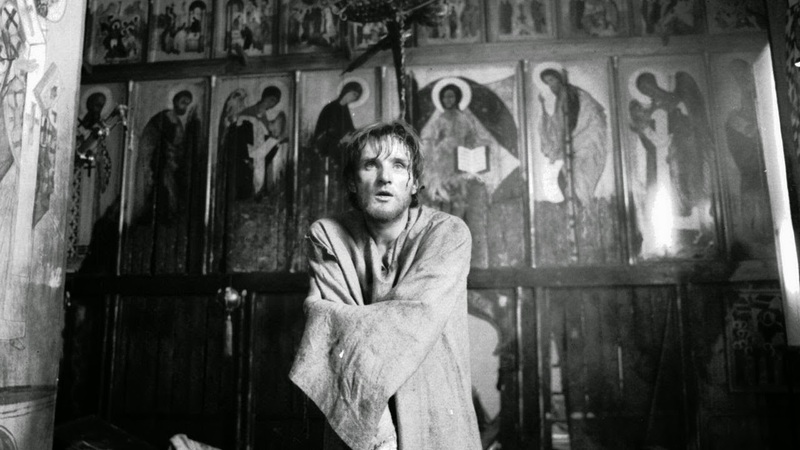 There is a level of brilliance on display during every minute of the epic picture Andrei Rublev that is difficult to even put into words, and there are a lot of minutes to analyze along the way. Clocking in at well over 3 hours in length, deciding to sit down and devote not only your time but also the mental energy it takes to devour such a movie can be daunting. Trust me though, it is worth it. Despite the fact that obviously we are not watching real footage from 600 years ago, Tarkovsky manages to create some authenticity with a sometimes crude and dated look to the film, but this isn't a flaw, it is actually quite stunning. Typically when I see a period piece taking place during a similar time, I can't help but see it as a Hollywood picture attempting to capture a realism that is impossible to create. Tarkovsky somehow transports us back to an era long before a camera could even be there to film. Everything seems to be lit naturally, something that is especially noticeable during sequences taking place indoors, when a face is shrouded in shadows only to be illuminated by the flicker of light from a candle. No matter how dull and dour and grey and cold the image appears to be on screen, it is consistently beautiful to look at. The screenplay, written by Tarkovsky and his co-writer Andrei Konchalovsky, took more than two years to put together and the time and effort is not lost on me as I witnessed this epic masterpiece unfold. Every word feels perfect and they are all delivered by an expansive and flawlessly assembled cast of unknown actors. As an audience, we may not literally see all of the work that goes into the entire craft of a film but often times we can feel it. Modern day studios try to churn out films and their sequels year after year, and you can sometimes sense that they were rushed. The focus was on box office receipts rather than art. 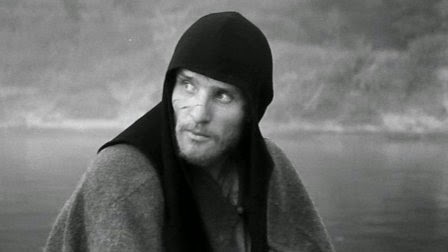 Andrei Rublev is the antithesis of this mentality. You can practically soak in the amount of passion that went into every single frame. I was once asked why I would root for Tiger Woods at a time when he was winning practically every tournament he played in. "I love to watch greatness at its absolute best. ", I responded. That's exactly how I felt as I experienced Andrei Rublev.